French beauty brand L’Occitane originated in the southeastern region of Provence. With a wealth of plant based expertise the brand has come a long way from its humble market beginnings. 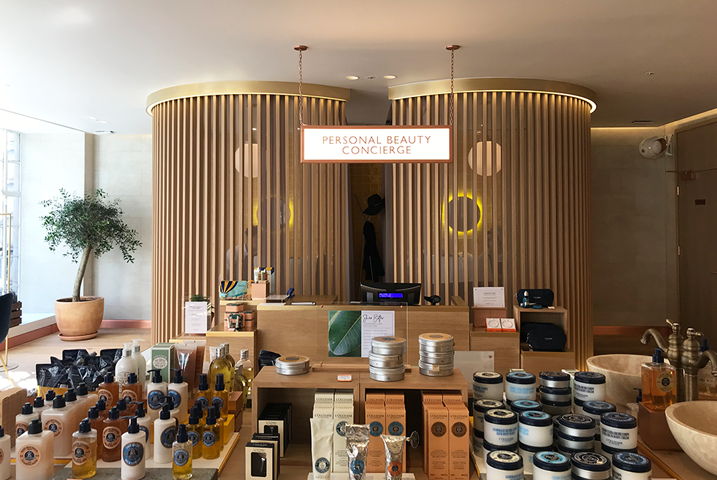 From producing locally distilled oils on Provençal stalls to what is now a wide range of beauty products, the Regent Street flagship store offers the latest skin and hair care in a space away from the bustling London street outside. What exactly does this multi-sensory store offer? Rather than a traditional retail approach to beauty products (for example; rows and rows of little bottles behind small but well used tester pots) this flagship is designed to offer a multi-sensory experience. There are, of course, the trusty shelving displays but there is also a wealth of other ways to try before you buy and immerse the senses in a myriad of touches, smells and visual stimuli. Personalisation is certainly a 2018 buzzword and customers are always looking for that extra something special. We have seen Pop-Ups like Crème de la Mer offering a bespoke engraving service and handbag brands monogramming their way to success. L’Occitane have added a personal touch by offering in-store engraving on over 20 products as well as their ‘Luxurious Gift Wrapping’ service. Customers can visit the ‘Gifting garden’ on the ground floor for high end wrapping paper, an exclusive wax seal and as well as a personalised printed ribbon. Being the largest store in L’Occitane’s portfolio the space is spread across two floors and houses a café and macaron bar by French pastry chef and chocolatier Pierre Hermé. Sweet treats are playfully presented amongst hand-creams and beauty displays and customers are invited to the ‘bar’ for hand massage treatments. This is not the first time the two French houses have collaborated. With both brands leaning towards luxury and a passion for high quality ingredients there are synergies in their offerings – A store on the Champs-Elysées in Paris last year combined the art of pastry, coffee and a L’Occitane in-store perfumery and scent installation. Similarly, the Regent street store invites visitors to enjoy a lounge on the upper floor with pastries and coffees surrounded by the scents and sounds of Provence. Customers can stay longer and book themselves in for a ‘moment of pampering’ with an express ritual in an organic wooden pod at the back of the space. As a souvenir of the day a photo booth with Provencal style backdrop takes a series of snaps via an inset touchscreen so customers can instantly upload content to their social media channels as well as taking home a print out. This is the UK’s first permanent multi-camera photo booth installation and is something instagrammers will appreciate. The space caters to all ages and beauty requirements. Those wishing to spend time and explore are encouraged to stay while those popping in for their favourite shampoo are able to do so. Experiential elements are there but not intrusive allowing visitors to shop the store in whichever way they choose. The term multisensory is appropriate for the space as there is an abundance of smells, textures, sounds, touch and even flavours available. Visually, the appeal of glossy tiles, brushed copper, white marble and warm wood all create an inviting backdrop to the flowers, greenery and products themselves. Next time you are in London, it’s worth having a look – even if only for a macaron.